Diameter outer Circle 4 3/8“ Width outer Circle 5/16"
Diameter inner Circle 3 1/2“ Width outer Circle 5/16"
We have received inquiries concerning the authenticity of this item and accordingly have given great weight to them. In fact, we had decided to class it as an early recreation since we cannot say with certainty that it's authentic. 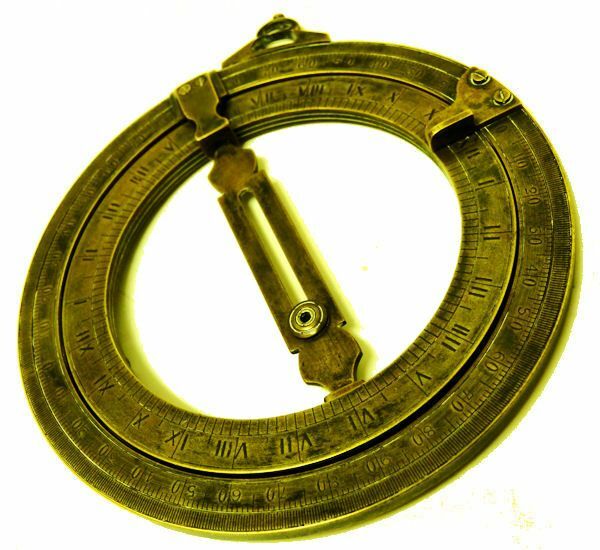 Having made that decision, we still continued our research and discovered that the most authoritative book on navigation instruments, Sextants at Greenwich lists Dring & Fage as the maker of an equinoctial sundial, Ca 1800 - 1850 on page 303. It is in the Maritime Museum Collection as inventory number AST 0165. Even though it is not pictured in the book, this still turns out to be a game changer. That one and this one are the only examples of this type that are known to exist. Usually, when an item is reproduced it is made in sufficient numbers to make the effort worthwhile which is not this case. Or if the purpose was to deceive and make lots of money off of a single piece, they would be better served to have chosen a name such as Charles Adams as the maker, and made a Universal style equinoctial rather than a fixed latitude one which most people don't even know exists. The likelihood then becomes stronger that this may be the "Real Deal". Detailed photographs and other information are provided for a viewer to make an informed decision of his own. Authentic items sell for $2000 and up, so we set the price on this one at $1200.00 to take all this into account. This may turn out to be a great buy for an astute collector willing to take a risk or it may not. OUR PHOTOGRAPHS: The pictures have been enhanced for sharpness, and in doing so it has exaggerated the coloration of the patina. In our professional opinion it is natural, and the the workmanship is of higher quality than is found in knock-offs, but again we can't be sure since there are always people out to fool the unsuspecting. It is also backed by our Guarantee of Satisfaction (see below) which says in essence that all our products are returnable without a hassle. For comparison, the photo below is unaltered. It was taken with Flash. KEY POINTS: There is no scale on the back of the center sighting index arm which swivels 360°. The obverse scale has five main marks and four intermediate marks extending across it, but they are what we believe to be astronomical symbols of the Zodiac, not numbers. The reverse of the index arm has no engraving. Other devices like this may have the months on the reverse. 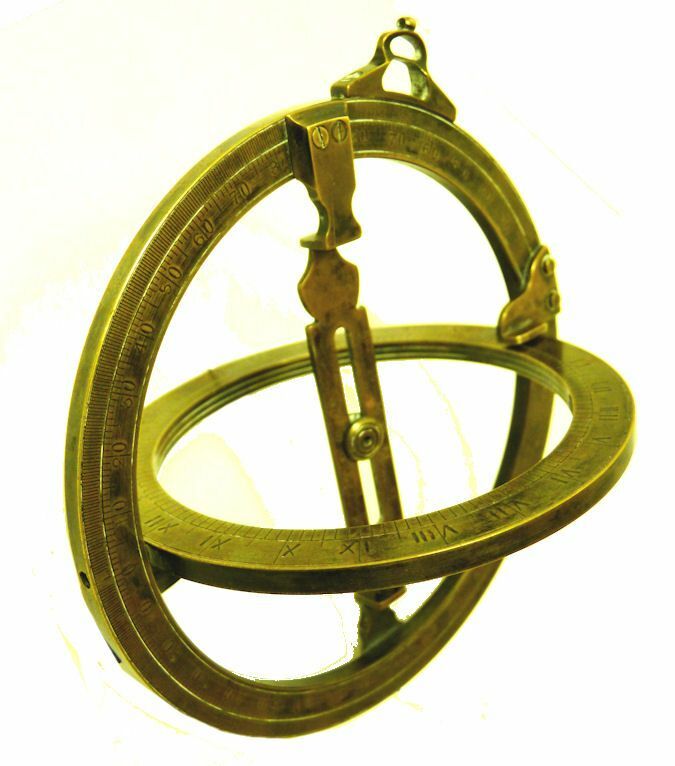 This device is intended to tell solar time at a specific latitude rather than the Universal type which is adjustable by a movable hanger. As is common with many of these devices. 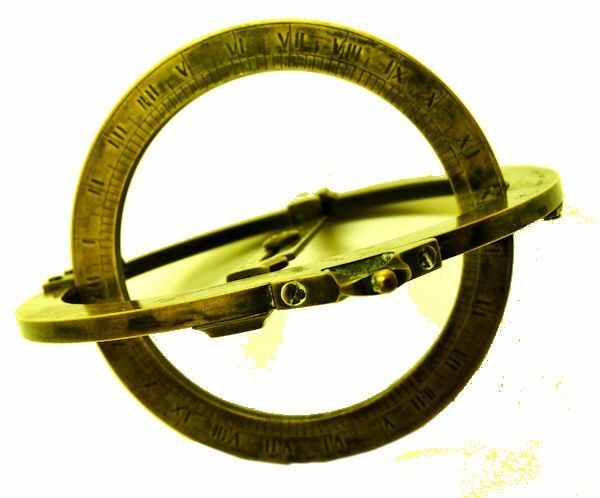 the backside of the outer ring has a quadrant's markings engraved for measuring the sun's altitude and is ideal for taking Local Apparent Noon sights of the sun. Even a knowledgeable expert didn't know about the use of this feature and called them "crazy radials". See the George Adams version below. ELEMENTS OF DESIGN: We will leave the analysis to others. What we know is, it appears to be a finely made instrument of quality British workmanship which we believe to have been made by Dring & Fage, London, as marked on the reverse. 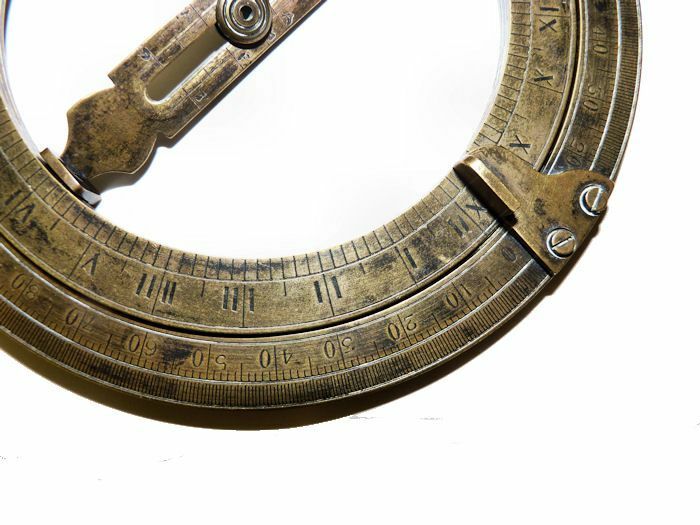 The flat brass index arm measures 2 3/4 inches long overall, and the inner circle measures 3 1/2” in diameter. The outer ring is 4 3/8 inches in diameter. The workmanship should date from the 19th Century. With the device held from the top hanger, the sliding index scale is fixed at a 20° angle from the horizontal which is the latitude to which it is set. Some of the places that would be included for this latitude are much of the historic Northern Leeward islands in the upper Caribbean, Upper Australia, and a band through Africa and India. SALE OF AUTHENTIC UNIVERSAL EQUINOCTIAL: Pictured below is a Universal equinoctial made by George Adams, the younger, Ca 1795 that was sold by Skinner Auctions for $3900.00. The ring used for hanging shown in this picture is missing from the one in this listing which is not unusual considering its age, but both seem to be similar in overall design and appearance except the Adams device has a sliding car serving as the hanger that runs on a track around the ring. This enables it to be set at any latitude making it the Universal type of which there are many more than the fixed latitude type. 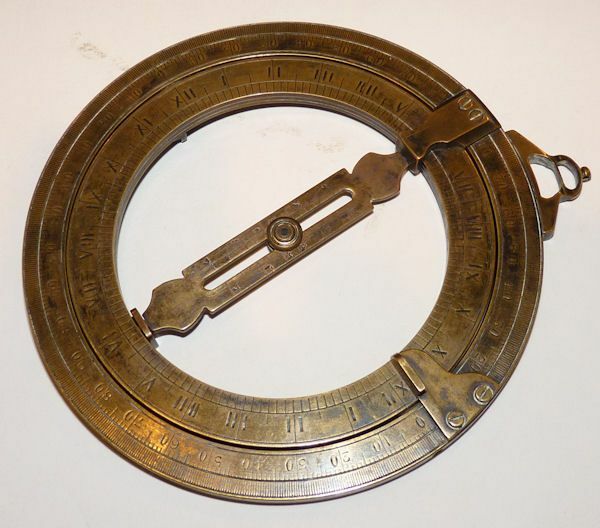 The Adams equinoctial has a scale of 0 to 90 degrees on the reverse which is the same as the one we are selling. THE MAKER'S MARK: For those interested in the maker's mark, the same authoritative book, SEXTANTS at Greenwhich by W.F.J Morzer Bruns, Oxford University Press, has numerous pictures of makers' imprints on navigation instruments of the same period of this device. It is a definitive Catalogue of most of the important instruments at the National Maritime Museum in England. Many are in script, but many are also in block letters which are irregular in their placement. This has been confirmed by a reader who has a Dring & Fage instrument of a different sort. The irregularity was quite common in imprints. See explanation above. INSTRUMENT CONDITION: The instrument is in excellent condition with the brass having a nice uneven patina of age. The patina is exaggerated in the photographs due to enhancement in photo editing, but in our professional opinion, it is natural. We have included some unaltered photos. There is some age spotting on the rings. Everything appears in working order. However, we have not tested it for accuracy. There is no case, nor is there a gnome other than the rotating index arm. A small brass ring is missing from which it would be hung. SHIPPING & INSURED PACKING by UPS Ground to the 48 contiguous States, $25.00 . A very high quality, named equinoctial that was purchased at an upscale antique show. Anyone having additional information, please advise. There is no scale on the back of the center sighting index arm which swivels 360°. The obverse scale has five main marks and four intermediate marks extending across it, but they are what we believe to be astronomical symbols of the Zodiac, not numbers. The reverse of the index arm has no engraving. Other devices like this may have the months on the reverse. The device is intended to tell solar time at various latitudes. As is common with these devices. the backside of the outer ringhas a quadrant's markings engraved for measuring the sun's altitude. DRING & FAGE, LONDON were a recognized English instrument maker that operated in London from various locations such as London Bridge and the Strand. They were active from 1790 to 1938. 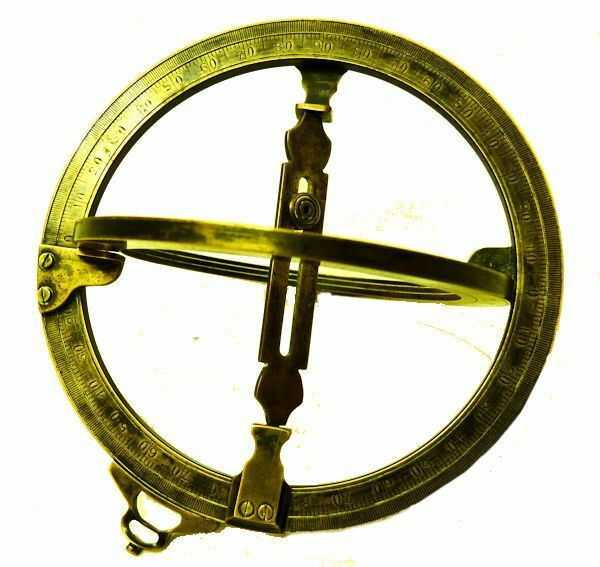 They are listed in Webster's database of scientific instrument makers, but are not known to have made equinoctals.. ELEMENTS OF DESIGN: We will leave the analysis to others. 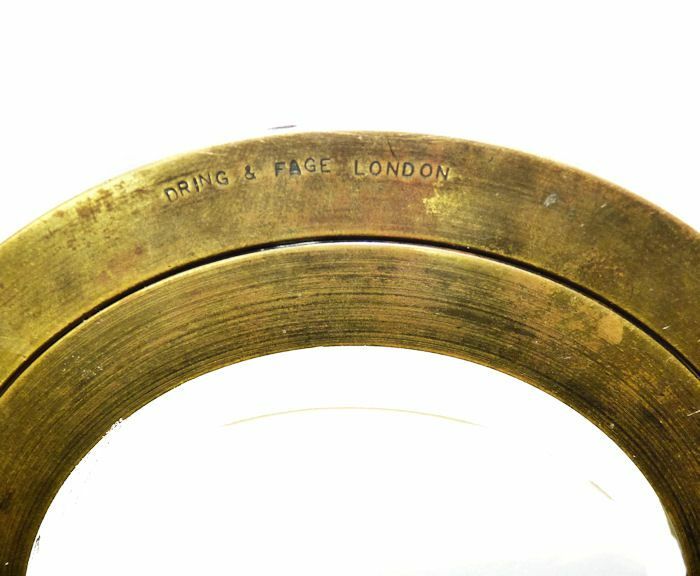 What we know is, it is a finely made instrument of quality British workmanship made by Dring & Fage, London, as marked on the reverse. 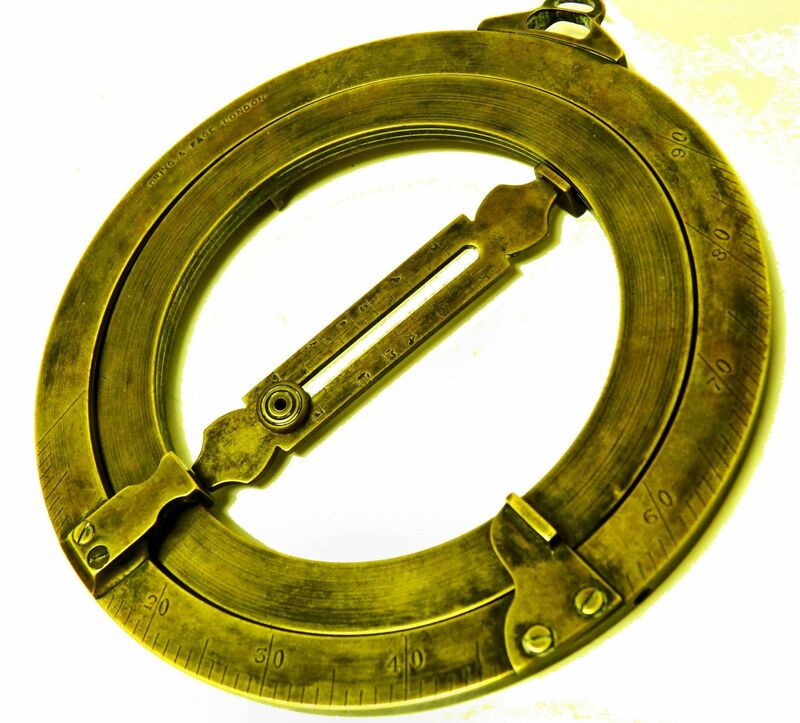 The flat brass index arm measures 2 3/4 inches long overall, and the inner circle measures 3 1/2” in diameter. The outer ring is 4 3/8 inches in diameter. The workmanship could date from the 18th Century. With the device held from the top hanger, the sliding index scale is at a 20° angle from the horizontal. We have received some inquiries concerning the authenticity of this item and accordingly have provided sufficient additional photographs and other information for a viewer to make an informed decision. In addition, since these items sell for $2000 and up, the price has been set at a low figure to take into account that possibility. The pictures have been enhanced for sharpness, and in doing so it has exagerated the coloration of the patina. In our professional opinion it is natural, and the quality of the workmanship is of the period. Also read our Guarantee of Satisfaction below. 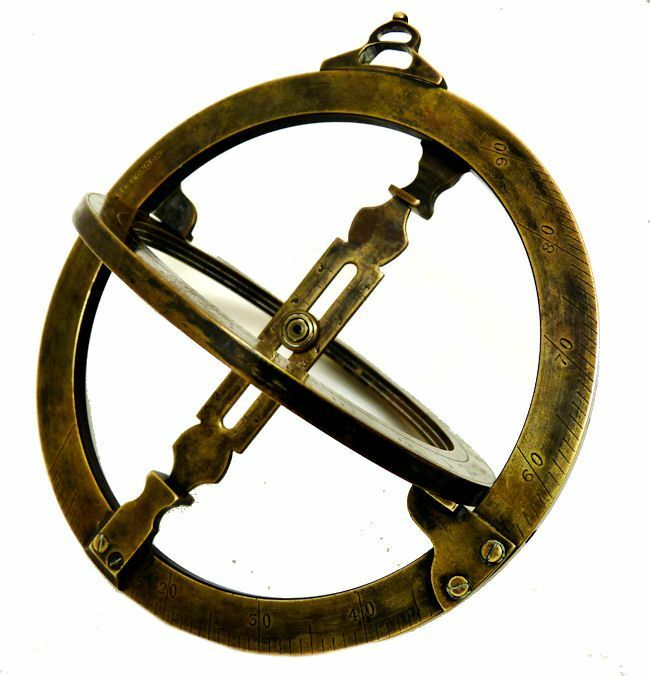 For those interested in the maker's mark, the authortive book, SEXTANTS at Greenwhich by W.F.J Morzer Bruns, Oxford University Press, has numerous pictures of makers' imprints on navigation instruments of the same period of this device. It is a definitive catalogue of most if the important instruments at the National Maritime Museum in England. Many are in script, but many are also in block letters which are irregular in their placement. The irregularity was quite common in imprints. See explantion above. INSTRUMENT CONDITION: The instrument is in excellent condition with the brass having a nice uneven patina of age. There is some age spotting on the rings. Everything appears in working order. However, we have not tested it for accuracy. There is no case, nor is there a gnome other than the rotating index arm. A small brass ring is missing from which it would be hung. 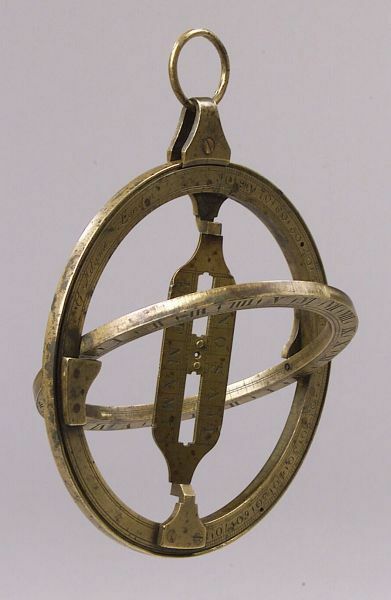 SALE OF COMPARABLE EQUINOCTAIL: Pictured below is a picture of an universal equinoctial made by George Adams, the younger, Ca17950 that was sold by Skinner Auctions for $3900.00. The ring used for hanging shown in this picture is missing from the one in this listing which is not unusual considering its age, but both seem to be remarkably similar in overall design and appearance. SHIPPING & INSURED PACKING by UPS Ground to the 48 contiguous States, $15.00 is included in the price.